Kazakhstan has been inhabited since the Neolithic Age: the region’s climate and terrain are best suited for nomads practising pastoralism. Archaeologists believe that humans first domesticated the horse in the region’s vast steppes. Central Asia was originally inhabited by the Scythians. The Cuman entered the steppes of modern-day Kazakhstan around the early 11th century, where they later joined with the Kipchak and established the vast Cuman-Kipchak confederation. While ancient cities Taraz (Aulie-Ata) and Hazrat-e Turkestan had long served as important way-stations along the Silk Road connecting Asia and Europe, true political consolidation began only with the Mongol invasion of the early 13th century. Under the Mongol Empire, the largest in world history, administrative districts were established. These eventually came under the rule of the emergent Kazakh Khanate (Kazakhstan). Nevertheless, the region was the focus of ever-increasing disputes between the native Kazakh emirs and the neighbouring Persian-speaking peoples to the south. At its height the Khanate would rule parts of Central Asia and control Cumania. The Kazakhs nomads would raid people of Russian territory for slaves until the Russian conquest of Kazakhstan. By the early 17th century, the Kazakh Khanate was struggling with the impact of tribal rivalries, which had effectively divided the population into the Great, Middle and Little (or Small) hordes (jüz). Political disunion, tribal rivalries, and the diminishing importance of overland trade routes between East and West weakened the Kazakh Khanate. Khiva Khanate used this opportunity and annexed Mangyshlak Peninsula. Uzbek rule there lasted two centuries until the Russian arrival. During the 17th century, Kazakhs fought Oirats, a federation of western Mongol tribes, including the Dzungar. The beginning of the 18th century marked the zenith of the Kazakh Khanate. 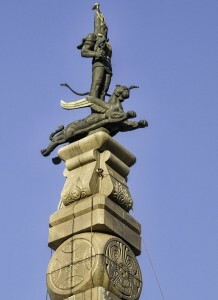 During this period the Little Horde participated in the 1723–1730 war against the Dzungar, following their “Great Disaster” invasion of Kazakh territories. Under the leadership of Abul Khair Khan, the Kazakh won major victories over the Dzungar at the Bulanty River in 1726, and at the Battle of Anrakay in 1729. 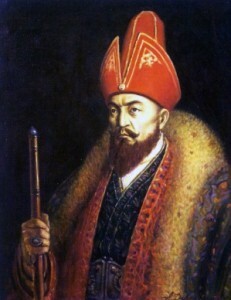 Ablai Khan participated in the most significant battles against the Dzungar from the 1720s to the 1750s, for which he was declared a “batyr” (“hero”) by the people. The Kazakh suffered from the frequent raids against them by the Volga Kalmyk. 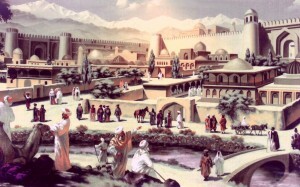 The Kokand Khanate used the weakness of Kazakh jüzs after Dzungar and Kalmyk raids and conquered present Southeastern Kazakhstan, including Almaty, the formal capital in the first quarter of the 19th century. Also, the Emirate of Bukhara ruled Shymkent before the Russians took dominance. In the 19th century, the Russian Empire began to expand its influence into Central Asia. The “Great Game” period is generally regarded as running from approximately 1813 to the Anglo-Russian Convention of 1907. The tsars effectively ruled over most of the territory belonging to what is now the Republic of Kazakhstan. The Russian Empire introduced a system of administration and built military garrisons and barracks in its effort to establish a presence in Central Asia in the so-called “Great Game” for dominance in the area against the British Empire, which was extending its influence from the south in India and Southeast Asia. Russia built its first outpost, Orsk, in 1735. Russia introduced the Russian language in all schools and governmental organisations. Russian efforts to impose its system aroused the resentment by the Kazakh people, and, by the 1860s, some Kazakh resisted Russia’s rule. It had disrupted the traditional nomadic lifestyle and livestock-based economy, and people were suffering from hunger and starvation, with some Kazakh tribes being decimated. The Kazakh national movement, which began in the late 19th century, sought to preserve the native language and identity by resisting the attempts of the Russian Empire to assimilate and stifle them. The competition for land and water that ensued between the Kazakh and the newcomers caused great resentment against colonial rule during the final years of Tsarist Russia. The most serious uprising, the Central Asian Revolt, occurred in 1916. The Kazakh attacked Russian and Cossack settlers and military garrisons. The revolt resulted in a series of clashes and in brutal massacres committed by both sides. Both sides resisted the communist government until late 1919. Although Kazakhstan experienced a brief period of autonomy (Alash Autonomy) during the tumultuous period following the 1917 collapse of the Russian Empire, the Kazakhs eventually succumbed to Soviet rule. In 1920, the area of present-day Kazakhstan became an autonomous republic within the Russian Soviet Federative Socialist Republic (RSFSR). 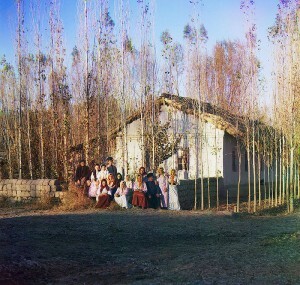 Soviet repression of the traditional elite, along with forced collectivisation in the late 1920s and 1930s, brought famine and high fatalities, leading to unrest (see also: Famine in Kazakhstan of 1932–33). The Kazakh population declined by 38% due to starvation and mass emigration. Estimates suggest that the population of Kazakhstan would be closer to 28–35 million if there had been no starvation or emigration of the Kazakh. During the 1930s many renowned Kazakh writers, thinkers, poets, politicians and historians were killed on Stalin’s orders, both as part of the Great Purge and as a methodical pattern of suppressing Kazakh identity and culture. 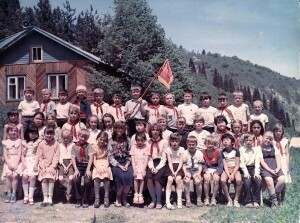 Soviet rule took hold, and a Communist apparatus steadily worked to fully integrate Kazakhstan into the Soviet system. In 1936 Kazakhstan became a Soviet republic. Millions of political prisoners and undesired ethnic groups were internally exiled to Kazakhstan from other parts of the Soviet Union during the 1930s and 1940s; many of the deportation victims were deported to Siberia or Kazakhstan merely due to their ethnic heritage or beliefs. For example, after the German invasion of the Soviet Union in June 1941, the Soviets transported approximately 400,000 Volga Germans from Western Russia to Kazakhstan in September 1941. Deportees were interned in some of the biggest Soviet labour camps of the Gulag system, including ALZhIR camp outside Astana, which was reserved for the wives of men considered “enemies of the people.” Many moved due to the policy of population transfer in the Soviet Union and others were forced into involuntary settlements in the Soviet Union. The Kazakh Soviet Socialist Republic contributed five national divisions to the Soviet Union’s World War II effort. In 1947, two years after the end of the war, the USSR founded its Semipalatinsk Test Site, the main national nuclear-weapon test-site, near the city of Semey. World War II led to an increase in industrialisation and mineral extraction in support of the war effort. At the time of Soviet leader Joseph Stalin’s death in 1953, however, Kazakhstan still had an overwhelmingly agriculturally based economy. In 1953, Soviet leader Nikita Khrushchev initiated the ambitious “Virgin Lands” program to turn the traditional pasture-lands of Kazakhstan into a major grain-producing region for the Soviet Union. The Virgin Lands policy brought mixed results. However, along with later modernisations under Soviet leader Leonid Brezhnev (in power 1964–1982), it accelerated the development of the agricultural sector, which remains the source of livelihood for a large percentage of Kazakhstan’s population. Because of the decades of privation, war and resettlement, by 1959 the Kazakh had become a minority in the country, making up 30% of the population. Ethnic Russians accounted for 43%. In the late 20th century, growing tensions within Soviet society led to an appetite for political and economic reforms, which came to a head in the 1980s. A factor that contributed strongly to this was Lavrentii Beria’s decision to test a nuclear bomb on the territory of Kazakh SSR in Semey in 1949. This had catastrophic ecological and biological consequences that were felt generations later, and Kazakh anger toward the Soviet system escalated. In December 1986 mass demonstrations by young ethnic Kazakhs, later called the Jeltoqsan riot, took place in Almaty to protest the replacement of the First Secretary of the Communist Party of the Kazakh SSR Dinmukhamed Konayev with Gennady Kolbin from the Russian SFSR. Governmental troops suppressed the unrest, several people were killed, and many demonstrators were jailed. In the waning days of Soviet rule, discontent continued to grow and found expression under Soviet leader Mikhail Gorbachev’s policy of glasnost. On 25 October 1990, Kazakhstan declared its sovereignty on its territory as a republic within the Soviet Union. Following the August 1991 aborted coup attempt in Moscow, Kazakhstan declared independence, thus becoming the last Soviet republic to declare independence. Ten days later, the Soviet Union itself ceased to exist. Kazakhstan’s communist-era leader, Nursultan Nazarbayev, became the country’s first President. He ruled in an authoritarian manner, which many believed was needed in the first years of independence. Emphasis was on converting the country’s economy to a market economy while political reforms lagged behind achievements in the economy. By 2006, Kazakhstan generated 60% of the GDP of Central Asia, primarily through its oil industry. The government moved the capital in 1997, from Almaty, Kazakhstan’s largest city, where it had been established under the Soviet Union, to Astana. In 2011 Switzerland confiscated US$48 million in Kazakh assets from Swiss bank accounts, as a result of a bribery investigation in the United States. US officials believed the funds represented bribes paid by American officials to Kazakh officials in exchange for oil or prospecting rights in Kazakhstan. Proceedings eventually involved US$84 million in the USA and another US$60 million in Switzerland.